A three-day weekend that involves flying with your six-year-old daughter to Universal Orlando for a special Despicable Me 2 and VIP Experience weekend is time well spent. Bella and I connected over the weekend like never before. We attended a special screening of the upcoming Despicable Me 2 (in theaters July 3! ), rode "Minion Mayhem", went on a scavenger hunt across both parks and were given a special VIP Experience of Universal Orlando. First, there were "Blue Men"... From the paint, colors and audience interaction, I enjoyed seeing Bella's amazement at all the interesting visuals of the show. After the show, we met one of the "Blue Men." Bella was scared and wasn't excited to have her picture taken with him. Noticing Bella's tentative stares, the Blue Man slowly walked over to us, and without a word, slowly took my iPhone from my hand and proceeded to snap a selfie. 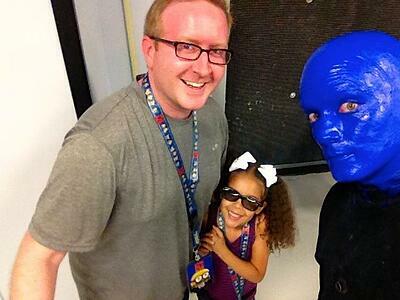 This may be something the Blue Men do every night, but for Bella and I, we felt like rockstars as we left the show! Here's the pic...this Blue Man is not only an on-stage talent, he's pretty good with an iPhone too. The Blue Man is actually holding my iPhone for this picture! This ride starts in Gru’s living room! Gru recruits you for one of his latest villian experiments. This experiment? He wants to turn you into a Minion! Here's Bella standing in Gru's living room! You wait in line in Gru's living room. The ride hasn't started yet! After surviving "Minion training" you are now a minion. Margo, Edith and Agnes' Adoption Anniversay is coming up and the girls aren't sure Gru's remembers. I won't give away much of the ride; but know the storyline of Gru adopting the girls plays a major role. 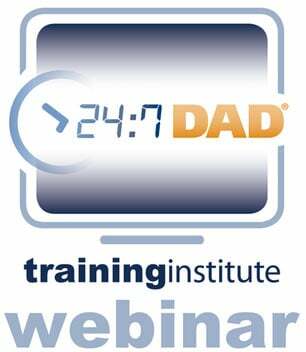 As a dad who works for NFI, I was blown away by the creative and powerful adoption theme in this ride. Bella and I were on a mission! We received our clues and with iPhone in hand, we set off to find our treasures. 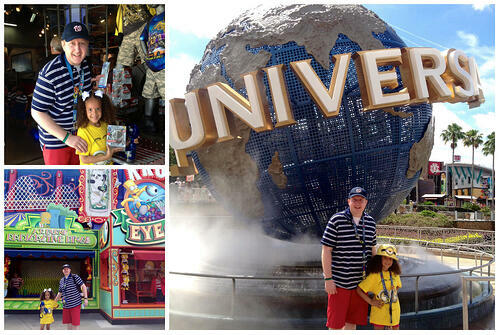 The clues from our hunt took us all across Universal Orlando and Universal Islands of Adventure. We gathered clues at Crusty Land, found the Transformers Allspark and much-much-much more across the both theme parks. As you can see, we are quite the dynamic duo! We were treated like rockstars during the Universal Orlando VIP Experience. We didn't wait in a single line. We were personally escorted with a tour-guide on a walking tour of both parks. And just to brag, we had exclusive backstage access and learned all kinds of interesting stories from our tour guide! Note: this was Bella's first-ever trip to a theme park. She is now spoiled and doesn't yet know about standing and waiting in lines! On the VIP Experience, we rode Shrek 4-D, where the only thing I remember is getting donkey snot sprayed on me...like three times. Donkey snot is cold, in case you're wondering. The Spider-Man ride is amazing. All Bella talked about after it was the flames and how she felt the heat from the fire! I honestly raised my 3-D glasses a couple of times during the ride to see what was a screen and what wasn't. Our adventure took us through Dr. Seuss Land too! 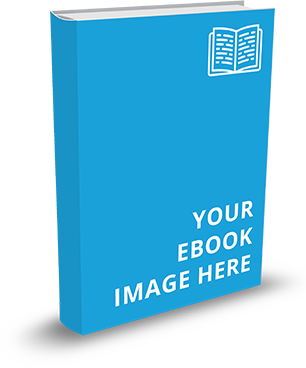 The Cat in the Hat™ ride takes you through the pages of Dr. Seuss's great book. You'll spin like crazy as Thing One and Thing Two make a mess and try to clean up before mom gets home! We rode The High in the Sky Suess Trolly Train Ride and the Seuss Caro-Suess-El, too! And as you can see from the pictures below, Bella met Big Time Rush! This ride wasn't for Bella...this ride was for me! As a boy who grew up pretending to be Optimus Prime (yes, I just dated myself!). 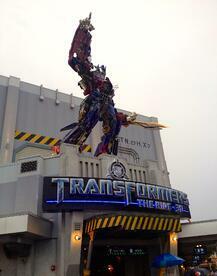 It was awesome to ride with the Autobots against the Decepticons. I was surprised when Universal announced we could have a private ride of this new adventure before it was to open this summer. This ride did not disappoint. I honestly couldn't tell what was real and what was the 3-D screen. And the simulated speed of flying through the air and working with Optimus Prime and Bumblebee was something the 10-year-old boy inside of me wants to do again! 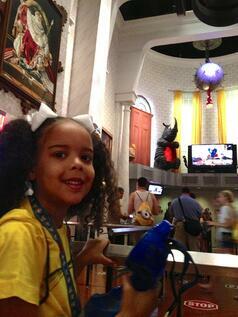 I mentioned Miss Bella fell in love after riding Minion Mayhem earlier. Well, The Sanders Family is happy to announce a new member of our family: Fluffy Unicorn Sanders! Please know Fluffy Unicorn is well taken care of! She can been seen below in our return luggage—my bag to be exact, at the hotel for a late night of cards (Despicable Me cards!) and buckled safely for our return flight! Since returning from Florida, Fluffy Unicorn has been busy with her new life in DC. She has camped out with Girl Scouts and enjoys multiple snuggles per day and night. Fluffy Unicorn is currently spending the weekend with my parents in Tennessee. Fluffy Unicorn Sanders is a great addition to our family. 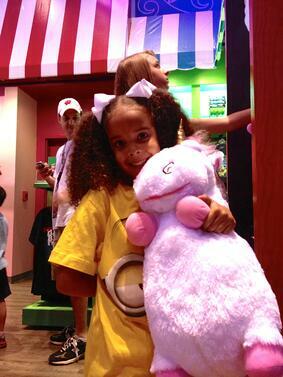 We need only adopt an additional Fluffy Unicorn for Bella's younger sister, Gabby! This three-day daddy-daughter weekend was time well spent. Bella and I not only have the memories to look back on, but we have the pictures and Despicable Me swag to prove it! I am grateful to Universal for the opportunity to be a rockstar dad for my Bella. Thank you, Universal, for understanding the importance of family and fatherhood. 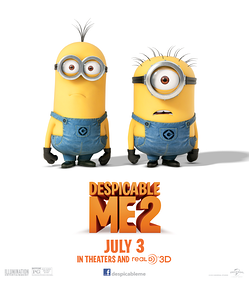 Be sure to check out trailers of the upcoming Despicable Me 2 in theaters July 3 and follow the minions online. 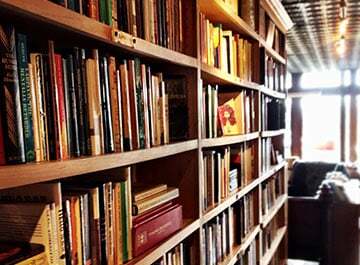 So, how are you and your kids spending the summer? 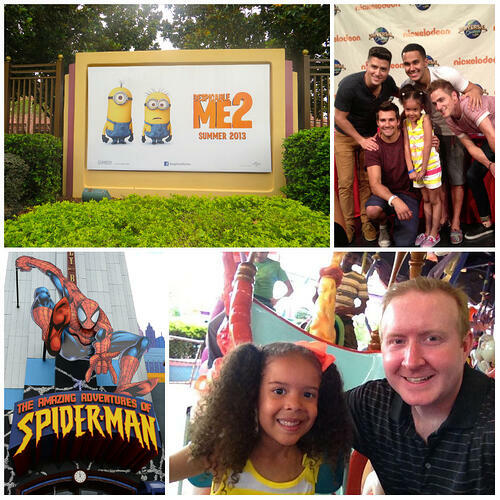 This post is part 2 of 2 of my daddy-daughter weekend visiting Universal Orlando for a very special Despicable Me 2 experience. Post 1 covered the movie and special "Despicable" parties. 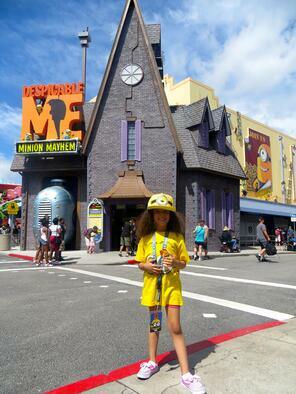 This post covers Minion Mayhem and Universal Orlando VIP Experience.